Well hello there! 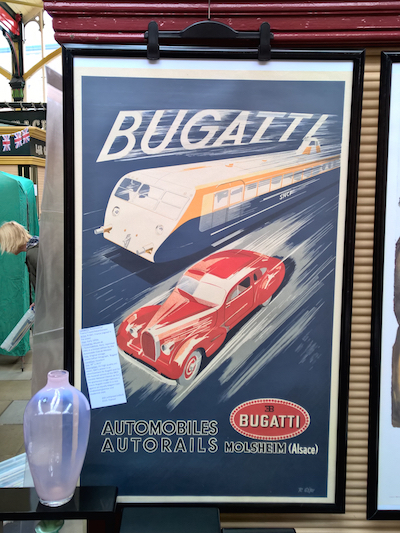 I'm Alistair Lomas - Finder of the Fair for July 2015. I've been attending the Vintage Village for 4 1/2 years as one half of Stu and Al, serving on the Stuart Thornley Cake Design stall. My face might be familiar off the tele box when I starred on an episode of Come Dine With Me based in Stockport. Those who've watched my dreadful attempt to cook on TV, fear not about the quality cakes on the stall - they're all made by Stuart without any interference from me! If you are ever interested in my life outside of VV, you can find me on Twitter @allaboutAl or Instagram @allaboutalistair. I'm ashamed to admit that it took until May this year to make my first vintage purchase from VV (see the Visitors Gallery May 2015). However I enjoyed the experience so much that I asked if I could take on this great challenge, which Sarah kindly accepted. 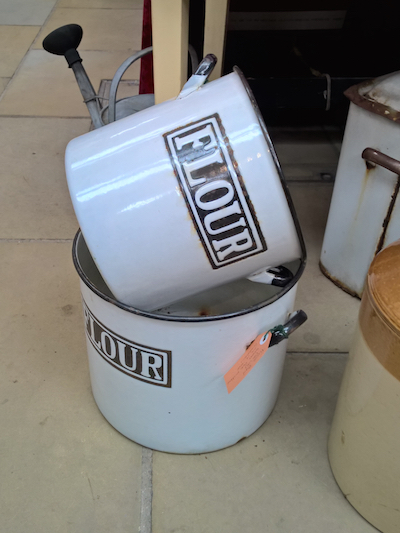 Without further ado, see what caught the eye of this vintage newbie (surely that's an oxymoron?) this month! 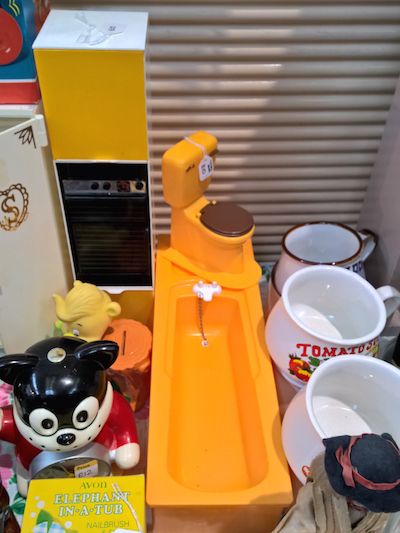 I'm not a Sindy collector, so this is an odd choice for me, but while chatting with Gemma there was one item that stood out among the array of trinkets - this wonderful bathtub and loo! The colour is fantastic and reminded me of my parents actual bathroom suite which was in an equally eye catching yellow. They've only recently just changed the suite so this was a fun reminder of the old bathroom (as I write this I realise how odd this sounds!) I'm sure that any Sindy dolls would love to relax in this tub, and if the colour is a little off putting, then there is always the loo to take care of any upset stomachs! My first vintage purchase from VV came from Rita’s stall, so I obviously had to see what she had on offer this month. 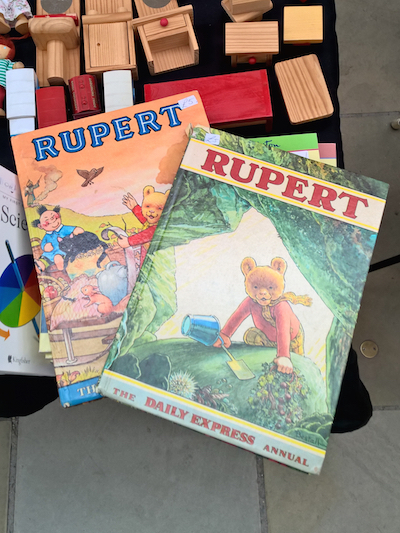 These two Rupert annuals resonated with me as my late Nana and Granddad purchased Rupert annuals for me as a child. I have always loved the illustrations of Rupert, and could imagine he'd be a wonderfully caring friend to have around. In the space inside to write who the book belongs to, someone incredible had written 'all of us' - how adorable!? I am told that this item is a bit of an exclusive to VV. 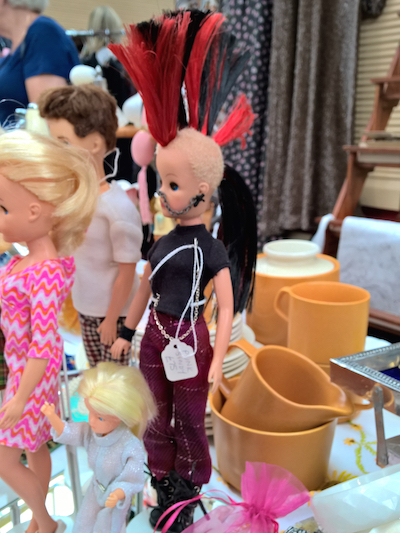 Although there were a number of Punk Sindys made, each one is unique, justifying the price these now command. I love her hair and once had a style vaguely similar myself, but far tamer, when I first moved to Manchester for university. How fantastic to have a true one off item brought to VV? It highlights the quality of the stallholders that are selling at the market each month - the reason why Alan and Sarah have made VV into an award winning event! 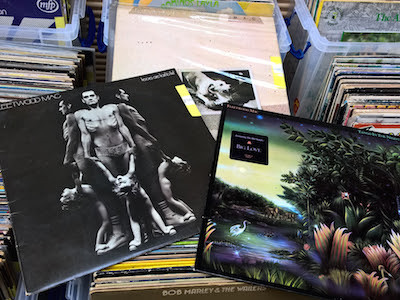 Before you go thinking that this is a bit of a cop out and self promotion to select something from Stuart’s stall, let me preface this selection by saying that I have actually spent my money purchasing these from our stall! 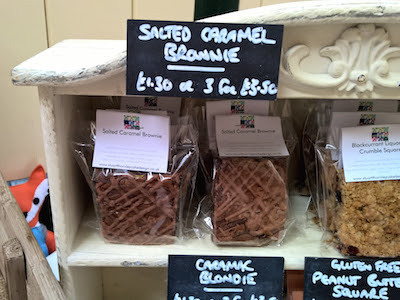 I think this is my favourite thing that Stuart bakes, and whilst one of the privileges of living with a baker is trying all the different items, there's only so many tasters I get before I have buy items from the stall like everyone else! I don't mind though, as this deliciously decadent chocolatey treat with a mouth watering salted caramel running through it is totally worth every penny. If you're planning on spending a full day at VV browsing everything everyone has to offer, then this will give you the sugar kick you need to power on when your energy levels drop and you start flagging. Gail from Essentially Eagle Vintage has her stall next to ours. It's become a monthly thing between us that we pick an item of clothing that she has for sale as 'garment of the month'. This little number got selected by me - there's something very Swedish (Sweden is a country I really want to visit) about the colours. 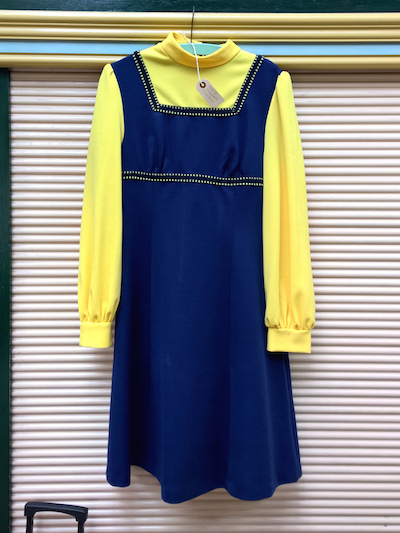 I like to imagine it's that this dress was once the uniform for ladies who worked at IKEA, or could have been something the ladies from ABBA wore when they were performing (Eurovision is a big obsession of mine). Emma has been a regular stall holder at VV for as long as I can remember, and used to cut my hair long before we met up at VV. She's one of the nicest people you will meet, and has a stall full of treasures. Working on the cake stall it's entirely fitting to have a cake stand included in my Finds. What I love about the ones Emma sells is that she sources vintage plates and creates these cake stands herself! 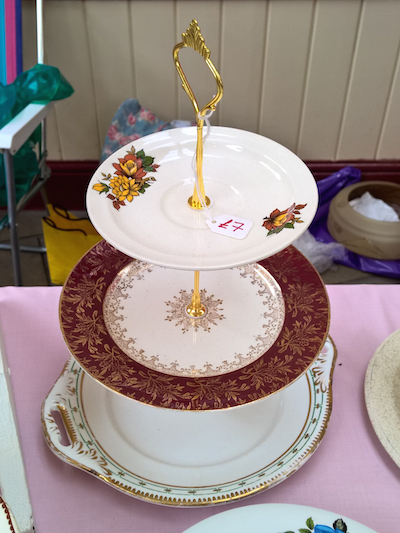 She was having a sale on her stands today, so these three tiers of gorgeousness were only £7.00 - bargain!!! My parents have been drinking gin & tonic for years, and I'd often tried gin in the vague hope that my taste buds had changed and I might enjoy a G&T in the summer. It never clicked with me and I presumed I would never be a gin drinker. However, a few years back something brought gin and I together, when I enjoyed a gin cocktail in Cardiff. Since then I've been a big fan, and every gin needs a tonic. 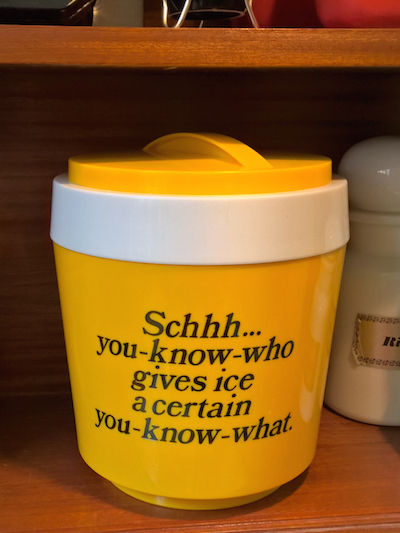 Schweppes are the original tonic water brand to me, so this striking yellow ice bucket looked amazing in the TinTrunk cavern at 20th Century Stores. Is there a better way for these summer months to keep your tonic on ice and at hand while out in the garden than with this? I think not! Well, for a 'vintage newbie' I think Alistair did superbly well! He even managed to work in the word 'oxymoron' (a first for our Finds) and drop a hint about his forthcoming birthday. Nice work, Al! See you in the cake queue next month!